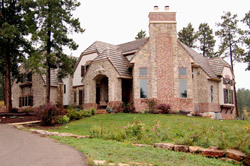 Welcome to Wilen Masonry, Inc.
Wilen Masonry, Inc. is a professional masonry contractor serving the Black Hills area, in which most of our work is in the Rapid City, Spearfish, Deadwood, Sturgis, Belle Fourche, SD and Hulett, Devils Tower, Sundance, WY. We meet with our customers, look over their plans, discuss their goals, and listen to their dreams. Then we endeavor to turn them into reality. We strive to become the “company of choice” with our employees, customers, builders, suppliers, and stock holders. In 2010 our masonry crews received the Construction Industry Center (CIC) Master Craftsmanship Award for our stone, cast stone, and block work on the Wyoming Welcome Center.